I have completed playing through the Lego Harry Potter Year 5-7 DS game, at points I tried to find a full walkthrough for the DS version of the game but was unable to find anything. So in order to give something back to the Nintendo DS world, I’ve decided to create my own walkthrough as I re-play the game. 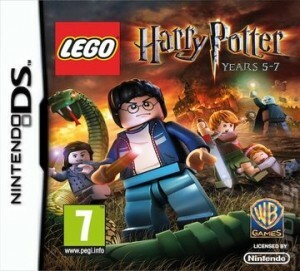 You may also want to check out Lego Harry Potter Years 5-7 for Xbox 360 or Lego Harry Potter Years 5-7 on the Nintendo Wii as the DS game is doesn’t have everything the larger console games do. I will be posting separate posts for each chapter of the game while I re-play it, once I have finished I will combine all of my posts together to create a full walkthrough which you can print off and use. I hope you find this useful, please comment with your thoughts as this is my first ever walkthrough. You’ll find yourself in Gringotts, standing in front of a dragon. The dragon will not hurt you unless you attempt to go through the door, before you can go through the door you need to do the following. (Wizards Hat Part 1) – (Free Play Mode) Switch to a ‘Dark Magic’ character (e.g. Professor Umbridge) and use ‘Dark Magic’ on the pile of red and black Lego bricks to left of the dragon to build a signal. A cart will appear with a ‘Weasley Wizard Wheeze Box (WWWB)’ on it. Switch to a Weasley character and use the ‘WL’ spell to move the ‘Weasley Walkway’ onto the main platform. (Amycus Carrow Character) – (Free Play Mode) (After completing Wizards Hat Part 1) Jump on the cart to gain the Amycus Carrow Character token. (Wizards Hat Part 2) – (Free Play Mode) While still on the cart, press and hold the A button to get a pair of sucker pads from the ‘WWWB’ and jump back on to the main platform. Head up the ‘Weasley Walkway’ to gain a Wizards Hat. To the left of the room you’ll see a few items on the floor, stand on the brown pad to the left to reveal some items for the bike. Place the items near the bike and then use the ‘Wingardium Leviosa (WL)’ spell on the bike items to build the bike. Mount the bike and while pressing the Y button head towards the dragon to reveal a path of studs and continue towards the door while still pressing the Y button then jump through the door. To the left of the room, use the ‘WL’ spell on the chest and then use the ‘WL’ spell on the Lego pieces which came from the chest to create a Quibbler Dispenser. Collect a pair of Spectraspecs and head to cabinet to the middle-right of the room. Shoot the cabinet and use the ‘WL’ on the scroll that is left behind. (Invincibility Red Brick) – Use the ‘Reducto’ spell on all eight silver status around the room and the Invincibility Red Brick will appear in the middle of the room. (Wizards Hat) – (Free Play Mode) Switch to a ‘Strength’ character (e.g. Hagrid) and head to back of the room. Use press and hold the A button to open the door and gain a Wizards Hat. (Alecto Carrow Character) – At the back-left of the room you’ll see a snake with a fiery cage underneath. Use the ‘Reducto’ spell on the cage and then use the ‘Aguamenti’ spell on the flames. Switch your character to Hermione and use the bag spot which has been revealed from the fire; this will cause a book to appear. Use the ‘WL’ spell on the book to make the snake sneeze and give you a cog. Use the ‘WL’ spell on the cog to place it on behind the chest and then use the ‘WL’ spell on the cog again. Switch your character to Bogrod to use the ‘Key’ ability on the light post to lower the light and gain the Alecto Carrow Character token. The room will fill up with fiery goblets, watch these are they will kill you. Switch your character to Ron and use the ‘Deluminator’ ability to get the light from the lamp. (Bogrod Character and Wizards Hat) – Jump your way to the top of the goblet pile, try not to fall in as you will have to start again and you’ll lose studs. At the top use the ‘Deluminator’ spell at place the light on the unlit lamp; this will give you the Bogrod Character token and a Wizards Hat. Head the way you came in and go to the right of the dragon. Use the ‘WL’ spell on the items on the floor and then use the ‘WL’ spell on the chains to release the chains on the dragon. Head round the other side of the dragon (I suggest going around the front of the dragon) and head to the far left of the room. Switch your character to Bogrod and use the ‘Key’ ability to lower the lit lamp, then switch to Ron and use the ‘Deluminator’ ability to get the light. Switch back to Bogrod and use the ‘Key’ ability again to lower the other light, switch back to Ron and light the other light with the ‘Deluminator’ ability. Switch back to Bogrod and use the ‘Key ability one more time to raise the light again; this will release the chains from the devils snare. Switch to another character and use the ‘WL’ spell on the on the chains to release the dragon. The aim to this level is to defeat all of the death eaters without being spotted. Head up the path and use the ‘WL’ spell on the white bricks on the floor to fix the rocket sledge. Use the ‘WL’ spell on the lever of the sledge to fire the sledge up the hill which will defeat the death eater. Head up the path and watch out of the death eater, head into the shelter and hide behind the sheet (stand on the gold ring for the lever). When the death eater comes round press the A button to pull the lever when the death eater turns around to walk over the grid. When the death eater falls down the grid you will have defeated it. Make your way up to the far right of the path and you’ll see the sledge which has crashed. Use the ‘WL’ spell on the sledge to defeat the third death eater, which will open the gate. Make your way up the path destroying everything for studs. (Aberforth Dumbledore Character) – Half way up you’ll see a snowman, shoot the snowman to gain the Dumbledore Character token. (Wizards Hat) – Shoot all 5 of the Harry Potter wanted posters to reveal a wizards hat, use the ‘WL’ spell on the barrel to place it on the wagon, use the wagon and barrel to jump up to the platform to gain the Wizards Hat. (Emalima Vance Character) – Head to the far right of the area and use the ‘Reducto’ spell on the far right coal store to gain the Emalima Vance Character token. Use the ‘Reducto’ spell on the far left coal store to real the key for the gate, pick up the key and head to the gate. Now you’ll have to defeat several death eater before you can use the key and exit through the gate. This entry was posted in DS and 3DS, Games, Lego Harry Potter Years 5-7 on March 17, 2012 by Tasha.